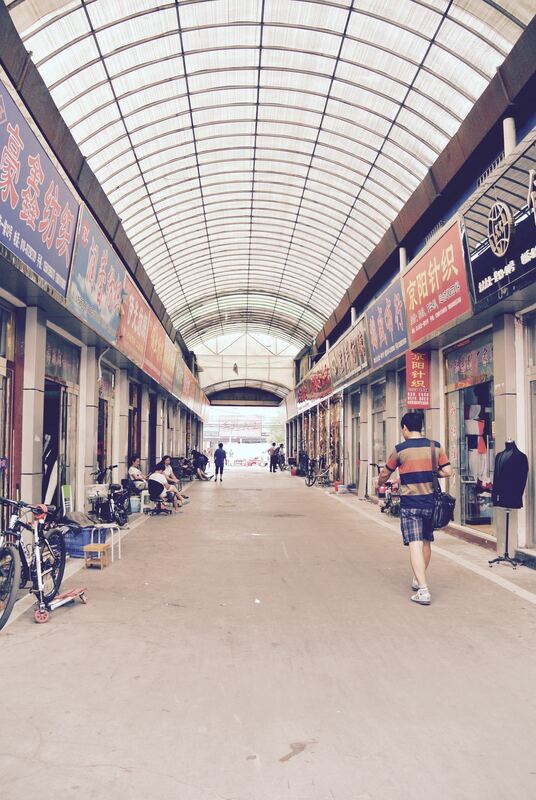 Sometimes work takes me to great places, one of them being Beijing, where I spent a week at the end of August. A lot of people find Beijing chaotic and exhausting, I find it fascinating and every time I go I try to do something new or different from visiting the usual touristic sites. 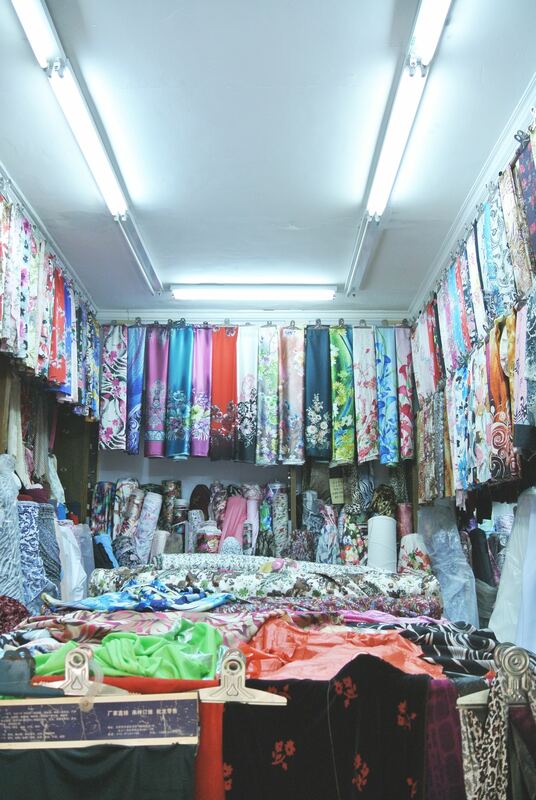 Luckily this year, before I left, I came across Megan’s of Pigeon Wishes post about a fabric market in Beijing, which was music to my ears and which I decided to visit on my day off. I had looked it up on the map and using Megan’s links, I managed to get some information on how to get there, luckily in Chinese too. I explained at my hotel where I wanted to go and they said that if I showed the directions to the taxi driver he would take me there. Excellent I thought and jumped in a taxi. Hardly any taxi driver speaks or understands English and mine was no exception. After driving for about 25 minutes, during which time I thought we had left Beijing, it was that far out from where I was, he got really excited and started saying “Now, now!” so I figured we were getting there. He drove inside something that looked like a private yard at the end of which there was a building with a sign reading “International Conference Centre.” Now I have seen a lot of weird things in Beijing but that didn’t look like a fabric market to me and definitely didn’t look like the pictures I had seen on Megan’s post. There was a security guy a few metres further, so with my phone at hand and the Chinese directions on the screen I asked him if I where at the right place, “No, no” he said and started shouting at the taxi driver who was still in the yard to take me back in to the place I wanted. So back in the taxi, I thought he was taking me there this time, but no, he drove around 200 metres and dumped me again in front of the international bus station. I knew it was around there and as I was getting fed up with the driver, I paid and got off. 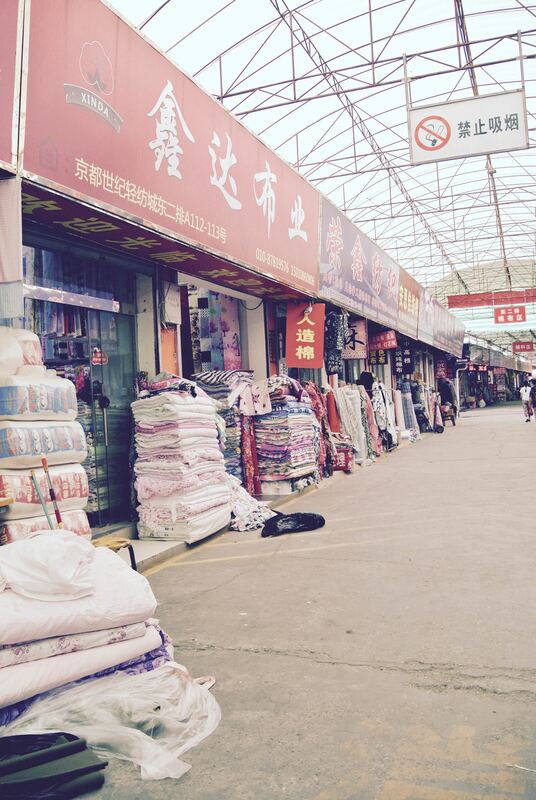 I walked a bit until I found a building that looked like a complex of shops selling bed linen and blankets. Wandered around for a bit until I found a young girl, who I thought might speak English. I showed her my phone and immediately she took out her phone typed something and showed it to me. “Go out and turn right,” it read. Oh great she’s going to give me directions I thought and got prepared to write down the rest of it. “Ok and then?” I asked her, but there was no then, that’s all she told me, so got out and turned right. I’m not going to bore you any more, the fabric market wasn’t on the right but was pointed to the right direction by two other girls who spoke better English and knew the area. And I can tell you it was worth all the trouble. 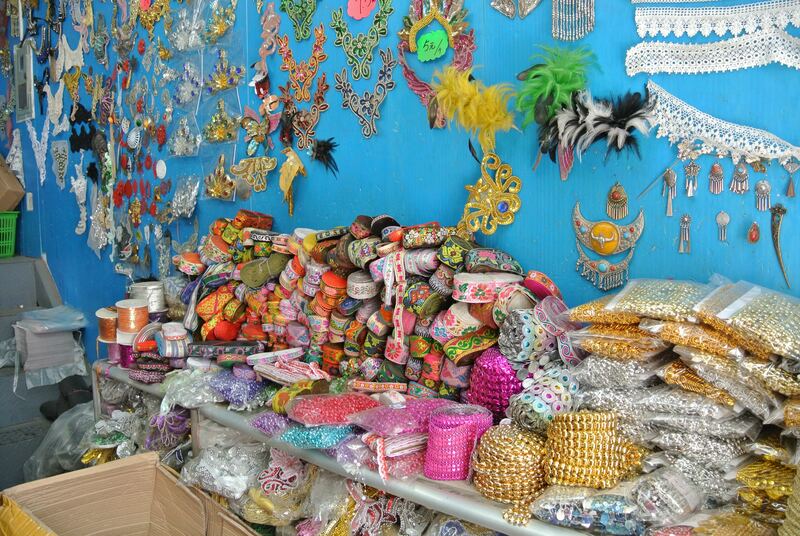 The fabric market is a wholesale market with endless rows of fabric shops. 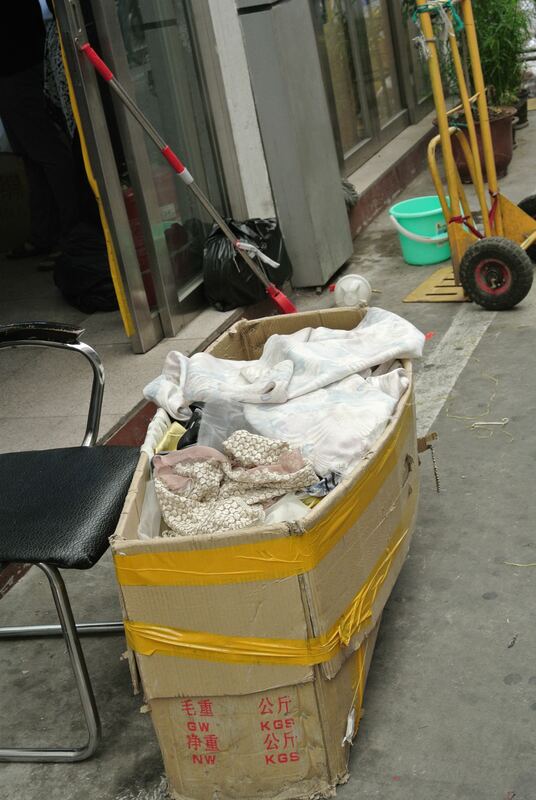 Most of these shops have a box or chair outside where they stack their remnants which using the method of the eye I would say are between 1 and 3 metres maximum, some are badly cut but in general one can find some gems if they are prepared to spend a lot of time going through these boxes and this is exactly what I did. 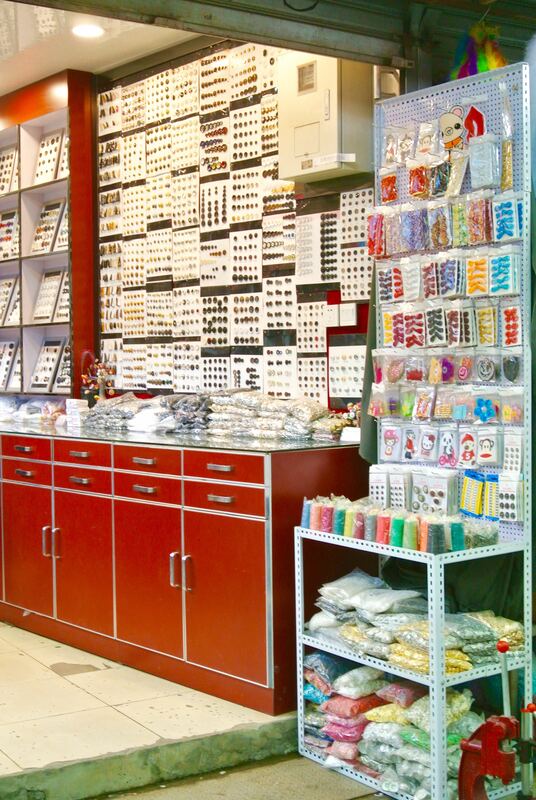 Except of fabrics there is also a big variety of trimmings and beads all in wholesale quantities. I wishes I had some project in mind so that I could buy some trimmings as they were dead cheap. I spent a log time, going from shop to shop and box to box but had some goodies in my bag and ready to go when I decided to cross over the road and see what’s on the other side. 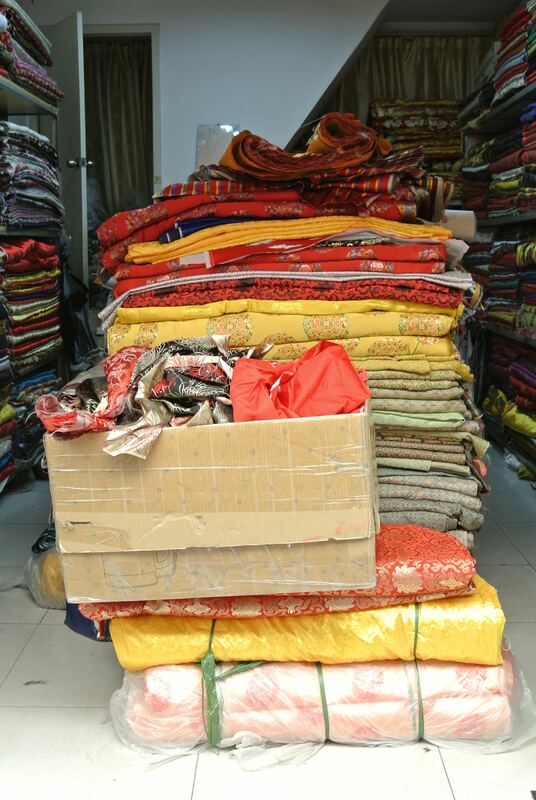 My eyes couldn’t believe it when I saw another set of rows of fabrics just as big as the one I had been, mostly cotton and linens. But also buttons, plenty of buttons. 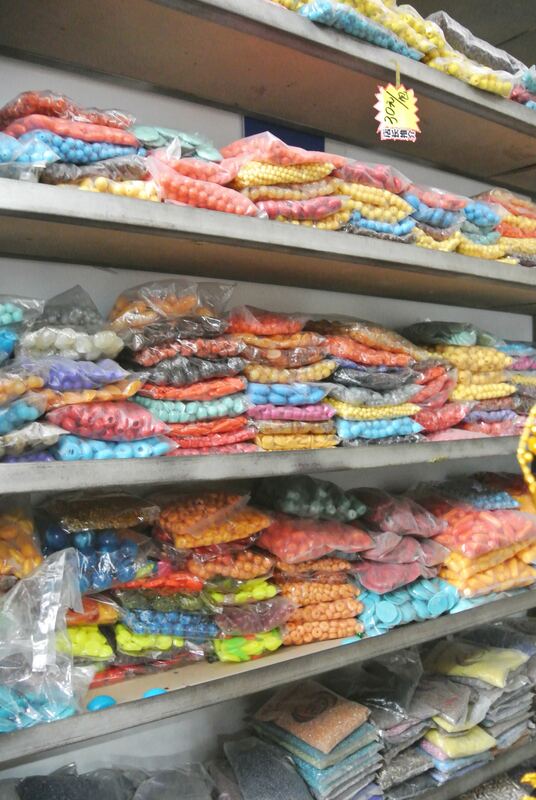 I could have spent days in the market but it was time to go. I got some cotton from there and headed back to the hotel, where I emptied my bag on the bed and admired all the lovely fabric I had bought. 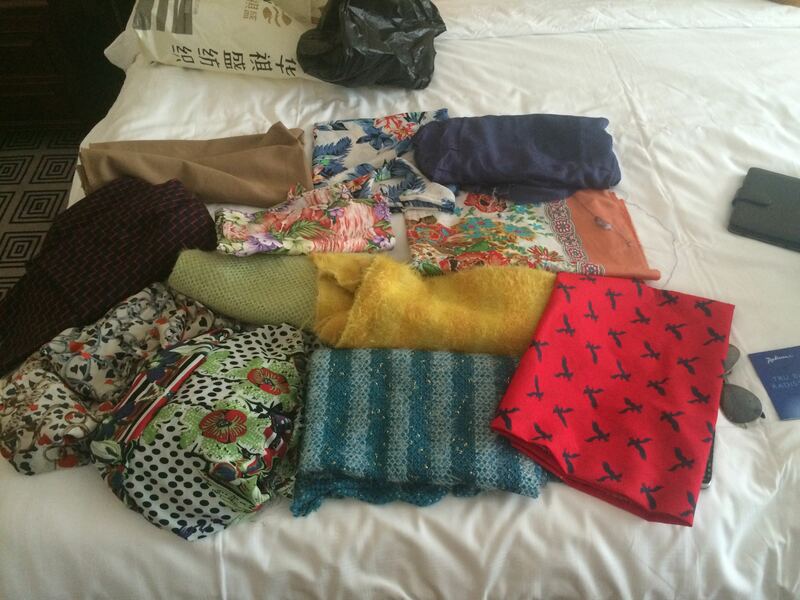 That was 160RMb which is around 16GBP, bargain! Now I wish I had bought more. 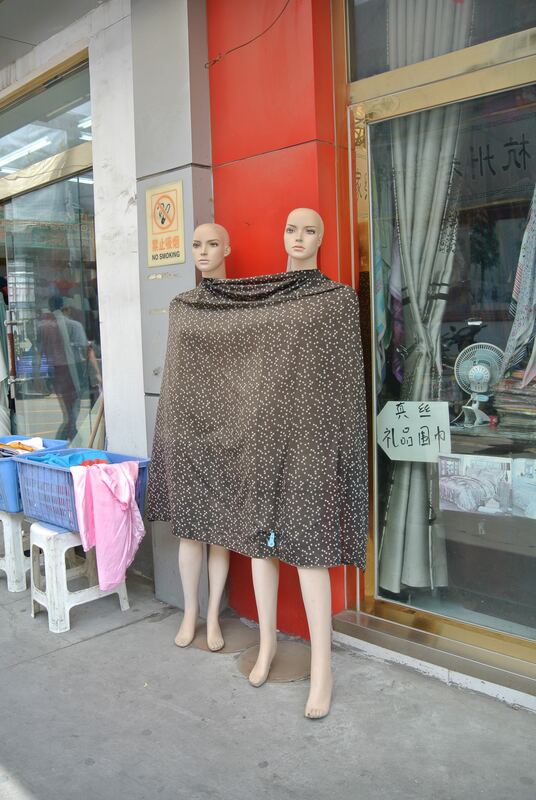 I will leave you with a pictures of these beauties that were modelling the fabric. Have a nice week everyone!! 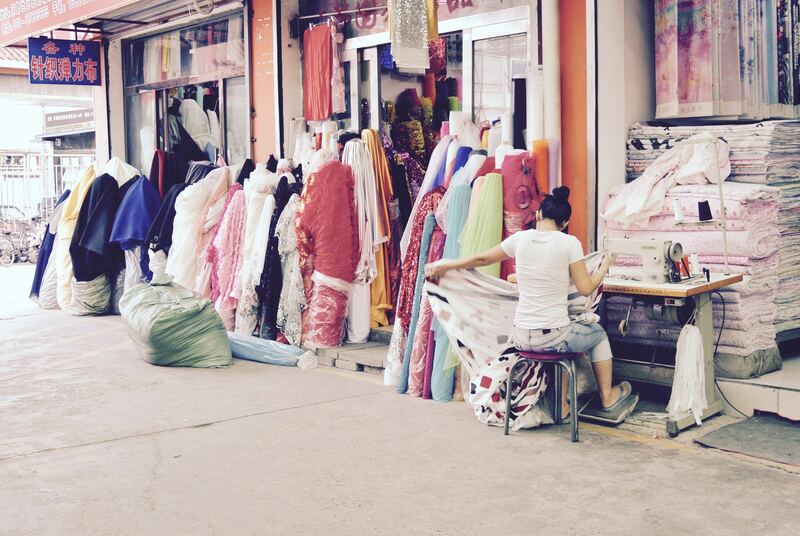 This entry was posted in sewing, Travelling and tagged Beijing, Fabric Market, fabric shopping. Bookmark the permalink. Cheap sounds good to me! I’m so jealous! Looks like so much fun. 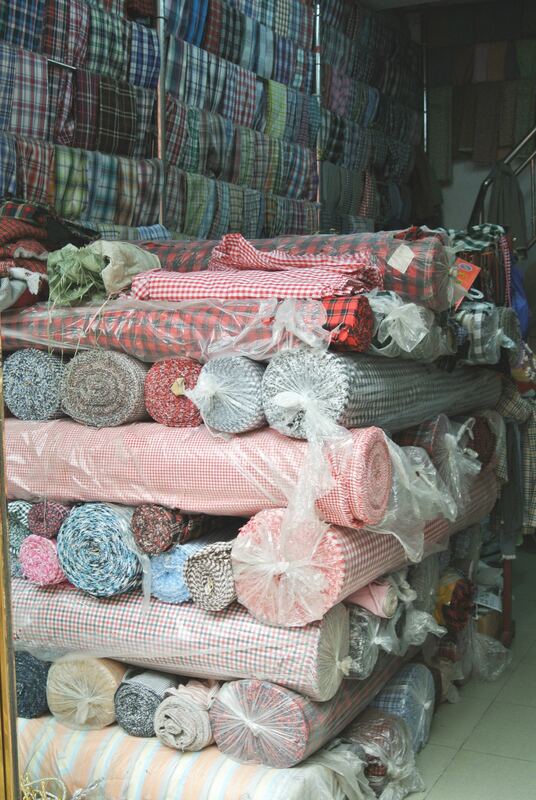 All fabric shopping is fun, especially when you have to go through boxes with fabric treasures hehe! Argh!!! I am so jealous! I was slightly envious when I saw the other blogger’s post, but now it seems everyone is going except me! I am so jealous! 😃 Good for you finding your way around. I can see it was well worth it. So many choices! Well Beijing isn’t the most accessible place in the world, the only reason I was there for a third time was because of work. Definitely worth it though, but I now wonder whether I would be able to find it again haha. Possibly not. 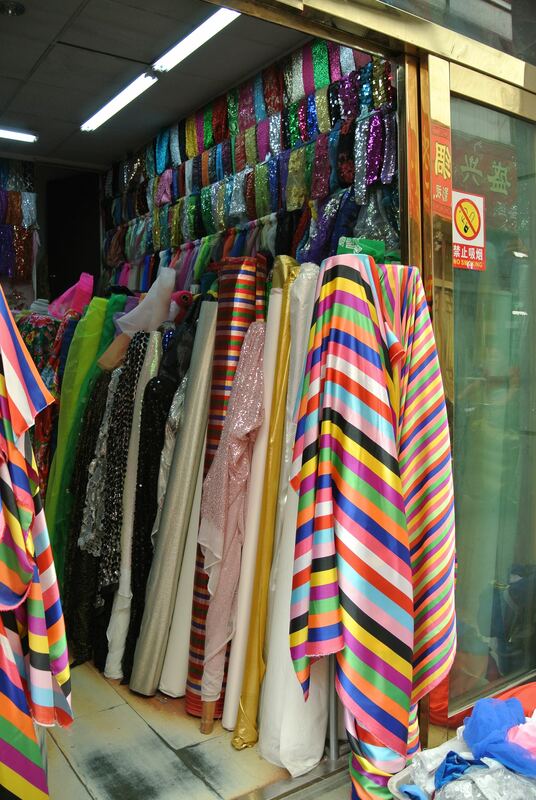 We may be in Beijing next year and I really hope I can find the fabric market! Thanks for the tip! You are welcome, I hope you can find it, but you should ask Meg at Pigeon Wishes for directions hehe, even if you don’t find it, Beijing is an amazing place to visit. I also wish I had gone a bit more crazy buying now I’m back where everything in 10x the price. Sorry about the confusion you had getting there. I’ve had such bad experiences with taxi drivers in China when I’ve not got a Mandarin speaker with me. Last time I went one was just shouting at me the whole way! I’m used to Chinese taxi drivers now, I never expect to take me where I want, when I get on a taxi, one was asking me for directions, as if I knew my way around Beijing haha! It’s shocking how much more expensive everything is here. 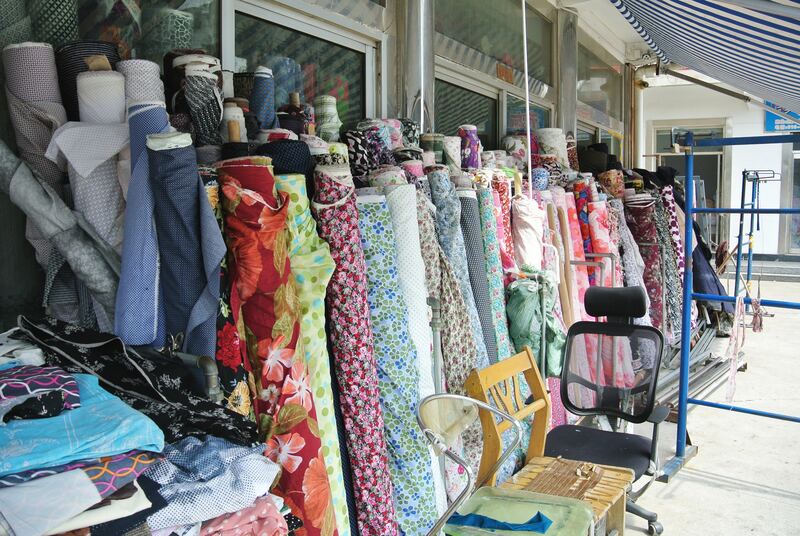 Did you end up buying any fabrics from the shops? 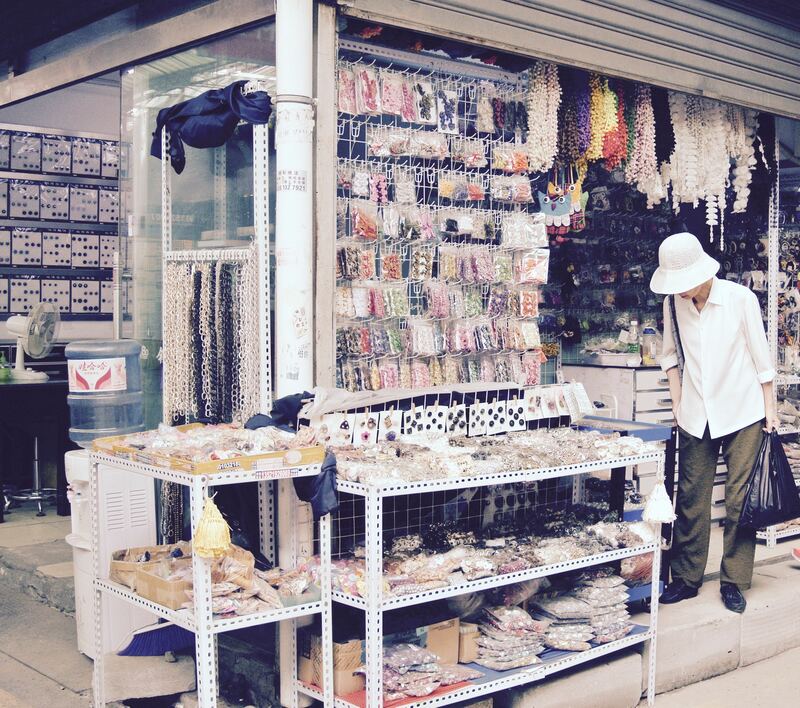 Whenever I am in Asia, I also frequent fabric shops because they are so cheap! But the downside is I usually have to buy another luggage just to take my purchases home with me. LOL! 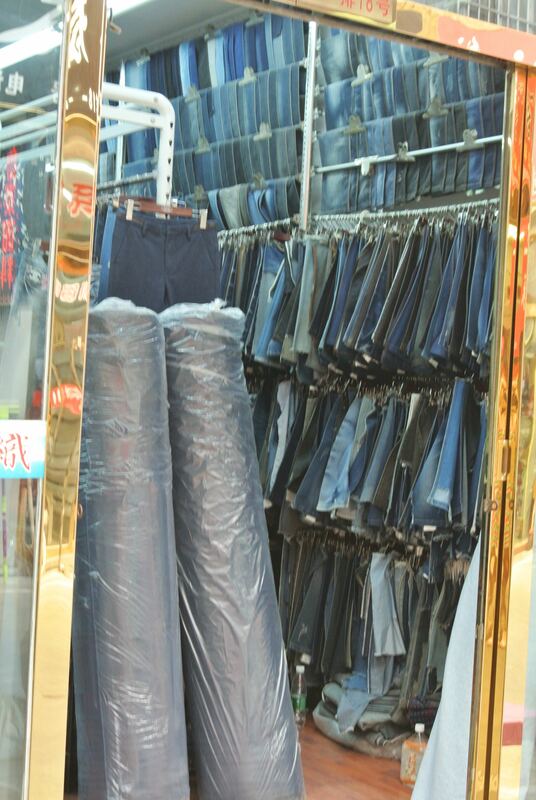 I did buy some fabric, but not as much as I could because I didn’t want to buy another suitcase, haha! It’s so cheap, it’s hard to resist!